The Cosby section of the Smokies park is mostly known for its long, arduous treks to high country destinations like Mt. Cammerer and Inadu Knob. But there is another trail there that is more moderate in difficulty. A good day hike on Gabes Mountain Trail is the 4-mile round trip to Hen Wallow Falls, a 90-foot, multi-tiered cascade. This is cool, dense forest, some of it old growth, that is nourished by creeks reaching like fingers down the slopes of the Great Smoky Mountains. I hiked the Gabes Mountain Trail to Hen Wallow Falls on Monday, August 13, 2018 beginning at 8:45AM and finishing about 12:15PM. My plan was to take the trail to the waterfall, then return. Hike Rating: Moderate. Steady uphill throughout the hike. Steep at the falls. Trail Condition: Fair. Quite rocky at the bottom and very rooty as you gain elevation. The base of Henwallow Falls is pretty dangerous from slippery rocks. Starting Point: 100 feet north of Cosby Picnic Area. Trail Traffic: No one on the way up and at the falls, but at least 30 others on the way down. Seemed like a day for groups of six or more. How to Get There: From the small town of Cosby, TN take Hwy 32 south 1.2 miles to Cosby Park Road and turn right. The national park entry sign is 100 feet up the road and the Cosby Picnic Area is 1.7 miles. You will pass Gabes Mountain Trailhead on your right just 100 feet before the picnic parking. Park there and walk to the trailhead. 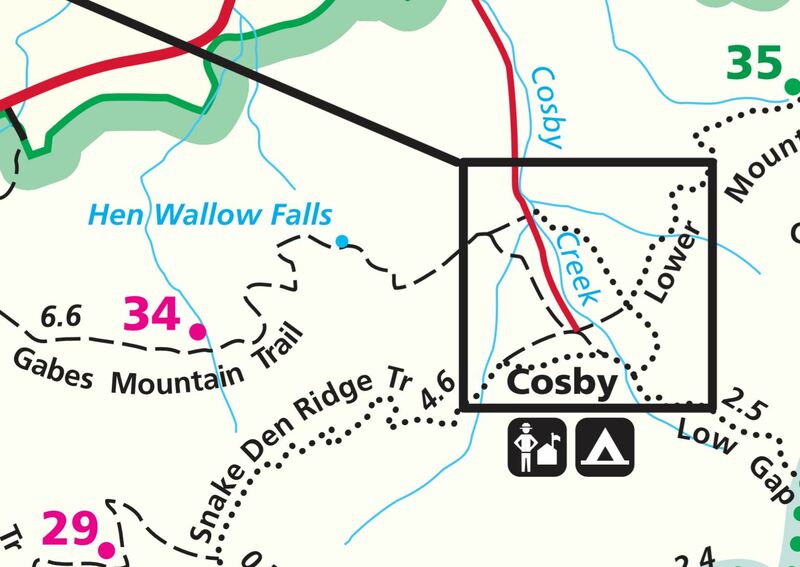 Map of the Cosby region of GSMNP including Gabes Mountain Trail. First, let me apologize for the static trail map above. I usually post interactive GPS tracks, but when I got finished with this hike, I discovered that my GPS recording had failed. Darn! I would also like to recommend that you wear high-top or mid-top boots when hiking Gabes Mountain Trail. With all the rocks and exposed roots found on this trail there are a myriad of opportunities for rolling an ankle. The support of hiking boots is important. Case in point: On my way back down I passed a woman who had rolled her ankle and was quite hobbled. Her family was helping her get back to the trailhead, but I could tell it was painful. I asked if I could help, or could summon help, but they said they would eventually make it. Do you know what she was wearing on her feet? No, not flip flops, but close. She was wearing Chuck Taylor canvas sneakers. No support. Please don’t do this. If you park at the Cosby Picnic Area, it’s a short 100 feet walk back down Cosby Park Road to the trailhead. The trail itself begins a gradual climb immediately, something it will do almost continuously for the next two miles. You will notice the trail tread is quite rocky here making it easy to stumble. The trail runs through moist woodlands with nearly every kind of tree that grows in the Smokies. I found it to be quite humid on this mid-August day, after a week or more of consistent rain. The gnats were in abundance, so I rolled on a layer of repellent. After three tenths of a mile a connector trail to Cosby Campground comes in from the left. There are footlogs over creeks and streams for the next half mile, including one fairly major crossing of picturesque Rock Creek. The trees get increasingly bigger and taller, and the woods darker and darker as you penetrate the heart of the forest. I saw a wide variety of mushrooms, and the first flowering tops of early goldenrod along the side of the trail. The only blooming flowers I noticed were a few sundrops that found one small spot of direct sunlight beneath the forest canopy. 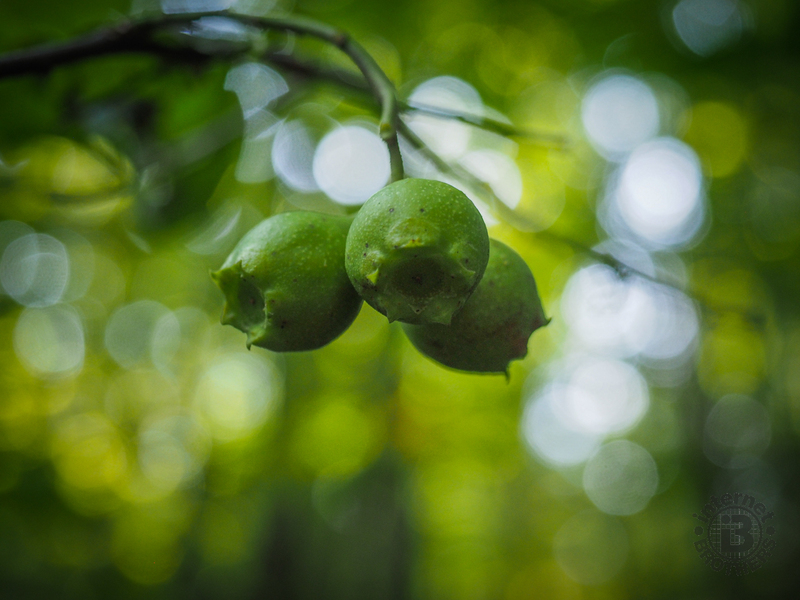 Of more interest to me were the buffalo nuts, sometimes called oil nuts, that were growing on small ground level branches. Buffalo nuts. Don’t be tempted to taste them. They will make you sick. At the halfway point there is a trail sign pointing to the left, to Hen Wallow Falls and to backcountry campsite 34. This isn’t really a trail junction, just notification that there is a sharp left turn. At times the trail takes on the look of a road, even as if it was laid in gravel. Well, this is because it used to be a road, one that the former residents of this area would use to take them to Hen Wallow Falls. You will notice artifacts of those early settlers deep in the woods. Boundary walls and stone chimneys are scattered throughout, but difficult to see during the green season when the woods are so dense. The Civilian Conservation Corps built this trail in 1934, and now nearly a century later, it enables us to explore the depths of this forest. It used to be filled with chestnut and hemlock, giants that stood over a hundred feet tall. You can still see the chestnut stumps and logs along the trail, testament to their durability. Rosebay rhododendron is also quite prevalent here, offering delightful white and pink blooms in early July. From a mile and a half up you begin to notice large boulders strewn throughout the woods, and then a short distance before the turn to the waterfall, there is a massive rock face in two levels on the left. Look closely at the variety of moss and lichen that adorns the wall. At 2.1 miles, there is another trail sign, this one pointing to a side trail to Hen Wallow Falls. It is a short, but steep, one tenth of a mile. About half way down keep your eye out on the left for a large boulder with seams of quartz running through it. As you round the final bend you hear the telltale sound of rushing water that announces a waterfall is near. The base of Hen Wallow Falls is dangerous. There is even a warning sign to keep your eye on young children. There is no splash pool here. Instead, the cascade from the 90′ drop plunges onto the broken rock at the bottom. The rocks are very wet, and very slippery. Hence the danger. Water falls over a very narrow top and widens as it drops over multiple tiers to the rocks below. Moss and lichens grow on the rock, giving everything a green tint. I happened to be fortunate to be there after more than a week of heavy rain, so the water flow was significantly heavier than typical mid-summer. I stayed for about a half hour, eating my lunch and enjoying the splashing of the cascade. I had it all to myself the entire time. Early bird and all that. That would soon change as nearly three dozen other hikers were an hour behind me. The climb back up to Gabes Mountain Trail from the falls is the hardest part of this hike. It is fairly steep, but it only lasts a tenth of a mile. The rest of my return trip was uneventful, other than the injured lady in the Chuck Taylors. The rising temperature and the typical summer humidity made for a very sweaty downhill hike. Summarizing Gabes Mountain Trail to Hen Wallow Falls, this is a moderately difficult climb of two miles through very dense hardwood forest. The reward at the end is worth it. The waterfall is a big one. You can continue out Gabes Mountain Trail several more miles beyond Hen Wallow Falls. There is a campsite out there, and I’m told there are pretty spectacular old growth trees. If you bring young kids with you, please watch them around the waterfall.